Studies show that anywhere between 36-53% of small businesses are involved in litigation at any given time in a year, making litigation a serious reality for the majority of enterprises. Unfortunately, even the most cautious of businesses that put in place a variety of protections to mitigate the possibility of litigation may still find themselves involved in a lawsuit, and successful businesses will need to have procedures in place to handle this reality. Here, the business litigation attorneys at Adelberg Rudow detail best practices when facing a lawsuit as a small business owner. Once a business owner is made aware that a lawsuit has been filed against them, it is their responsibility to ensure any pertinent physical or electronic information is preserved for discovery. This is known as a litigation hold, and complying with the litigation hold is key to preventing future discovery sanctions or other negative consequences. Once a litigation hold has been sent, the plaintiff must take reasonable measures to preserve any electronically stored information (ESI) or physical documentation that may be relevant to the lawsuit. The defendant will be responsible for preserving key ESI and physical documentation they possess as well, and the plaintiff’s attorney should also send a litigation hold to the defendant. Small businesses may also purchase a variety of insurance plans that can cover the legal and potential judgement costs of many types of lawsuits, such as third-party injury claims, defamation, employee suits and more. A copy of the lawsuit should be promptly forwarded to the insurance company in order to preserve the insurance coverage. It is also prudent for business owners to speak with their insurance company directly to ensure that their policy will actually cover the lawsuit they are currently facing. Litigation can be a costly, time-consuming and stressful endeavor, so it is often in the best interest of small businesses to see whether a dispute can be resolved outside of the courtroom. Engage an experienced attorney to help you review the case and ensure that you understand all of the key elements. You and your attorney can also review the lawsuit to ensure there are no inaccuracies or inconsistencies, such as an incorrect entity or business owner name—inconsistencies such as these may provide grounds to dismiss the case. Once the lawsuit has been thoroughly reviewed and the nature of the case is understood, your attorney will be able to assist you in finding ways to potentially handle the dispute outside of the courtroom in a more timely, reliable and cost-effective way, such as mediation, arbitration or other vehicles. Your attorney should then discuss these potential alternatives with the defendant on your behalf. It is important for business owners to remember that anything they say regarding a lawsuit can be used against them in court, and so it is advisable for business owners to allow their attorneys to speak to the plaintiff on their behalf. This includes the defendant’s response to the lawsuit, which should be made within 30 days and include an admissions or denial of each of the plaintiff’s allegations, your defenses and counterclaims against the plaintiff or other defendants and whether you wish for a jury trial. Business lawsuits can be highly technical and complex, and most business owners simply do not have the ability to handle such issues on their own. If your business is facing a lawsuit, immediately contact a reputable business litigation attorney to discuss your legal options. 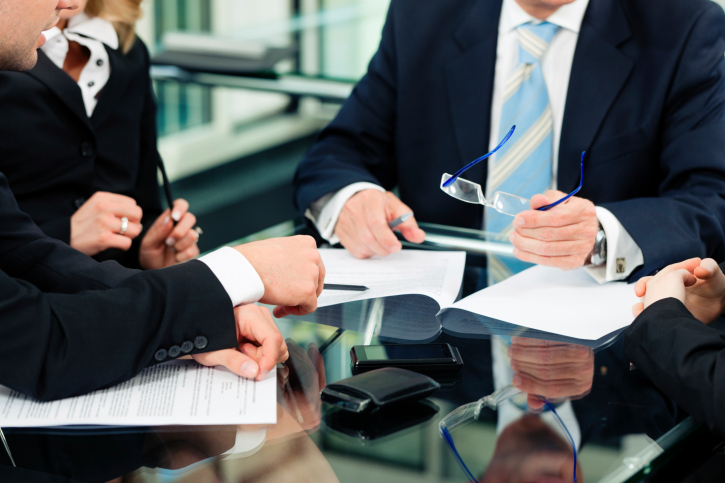 The business litigators at Adelberg Rudow have years of experience handling a variety of business disputes and take a results-oriented approach in every case they handle. To learn more about how their attorneys can help your small business, contact Adelberg Rudow today.